Spray 3-quart slow cooker with cooking spray. In 10-inch skillet, cook beef over medium-high heat 5 to 7 minutes, stirring frequently, until thoroughly cooked; drain. In slow cooker, stir beef, half-and-half, pepper and cheese until blended. Cover; cook on Low heat setting 5 hours. About 5 minutes before serving, stir soup. Top individual servings with tomatoes, lettuce, onion and pickles. 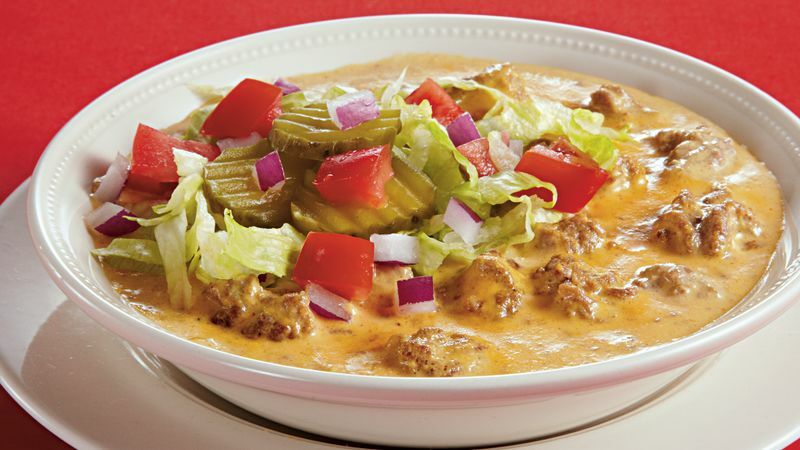 All the elements that make a great cheeseburger are present in this slow cooker soup. If you prefer a milder soup, use regular prepared cheese product instead of the spicy variety.